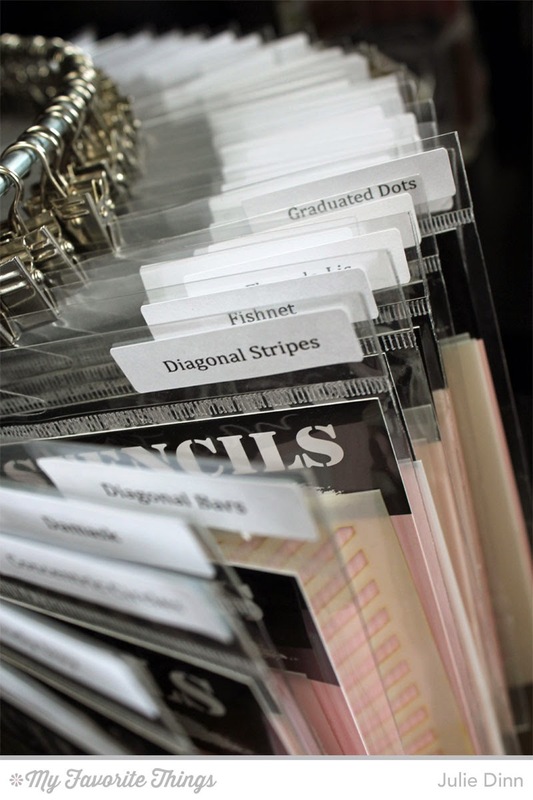 Welcome back for another day of organization tips. Today we are tackling stencils. If you are like me your stash of stencils has been growing and growing over the past few years. I LOVE all the different things you can do with them. 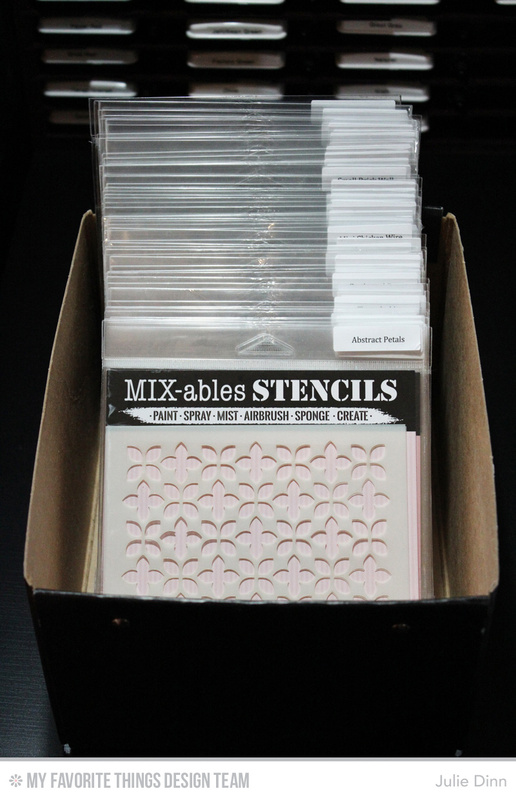 I currently store my stencils in the clear bags that they come in. I say currently as I will soon be switching my stencil storage. After seeing Cindy's post a few months ago about storing stencils in 6" x 6" page protectors I was determined to switch things up! I can't wait for my page protectors to arrive. I wasn't kidding yesterday when I said that I am always looking for ways to do things better! I mentioned yesterday that I recently took down my large Clip It Up. In addition to stamps and dies, I was also storing my stencils on the Clip It Up. One of the things that I liked about this storage method was the stencils were super easy to flip through. One of the issues with storing the stencils this way is that they took up a ton of room! Each stencil had it's own clip which made them far bulkier than they needed to be. I recently shared my little stencil secret, for those of you that didn't read about it, I will share it again. It's a good one! In each package, I store two of each stencil. That's right, two of each. 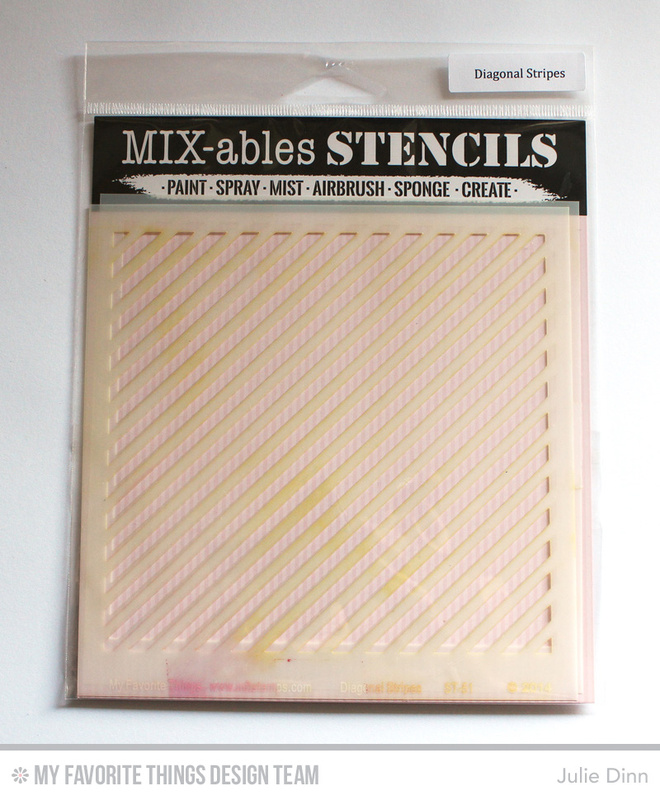 I use one stencil exclusively for embossing and one for paints, inks, and other mediums. Here's a side by side picture of the two stencils. As you can see, the one on the left still had some ink residue on it. I LOVE that I never have to worry about extra ink left behind on my dirty stencil. I'm not the best at cleaning my stamps and stencils right away after using them, so having an extra stencil for embossing is a lifesaver for me. 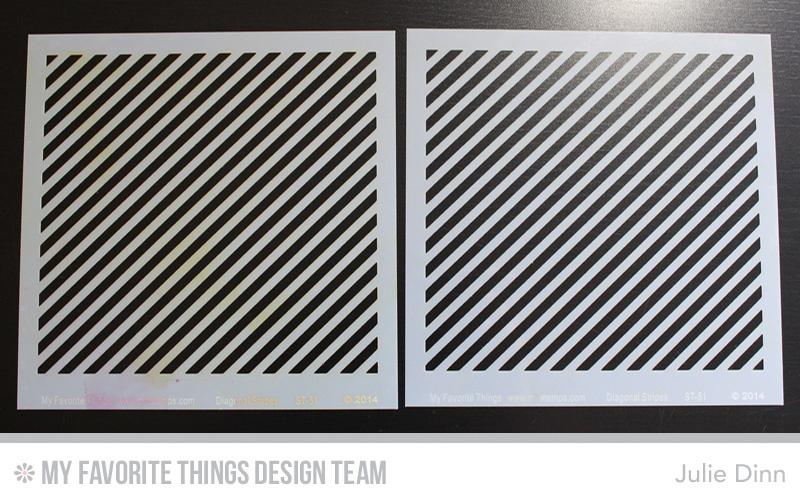 Be sure to check out the MFT Blog to see how the rest of the Design Team stores their stencils. I know they have some fabulous ideas to share with you. 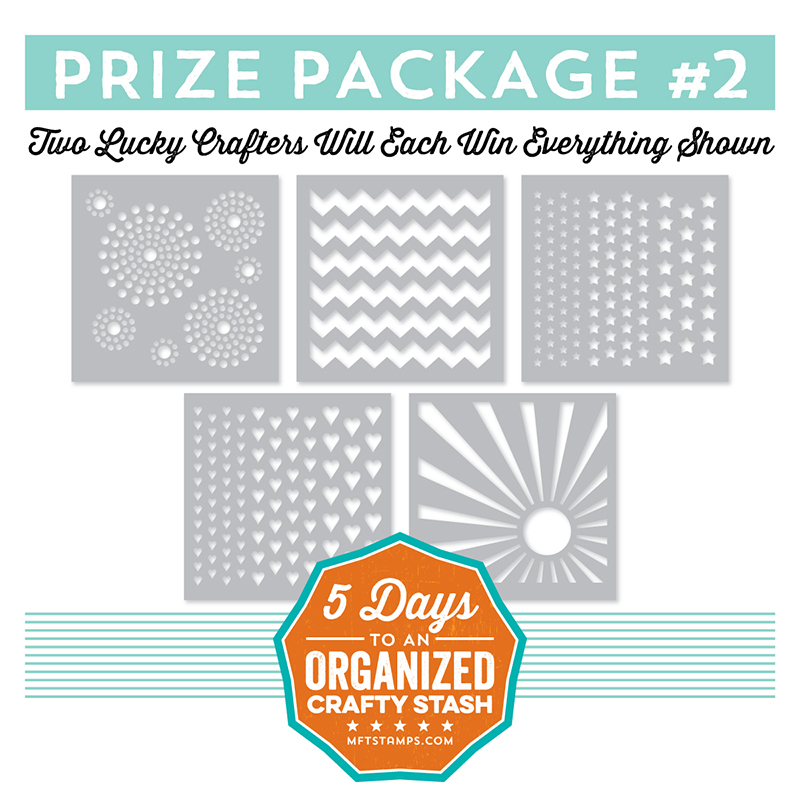 You'll also want to check out the details on the prize package below! I love that clip storage that you currently have, but I could see that with so many stencils, it would take up a lot of room. Yeah for the 6x6. I am thinking of going that direction, too. Ooohhh, why not display all your lovely cards on your clip storage, of course in protective bags. I'm leaning towards the 6x6 page protectors on a ring storage since I don't have too many stencils. It looks like you have a TON so being able to quickly flip through them would probably be easier for you! Thanks for the tip on keeping two stencils although that is definitely something I cannot afford!! We can always dream! I love that clip storage also.. I really like the new way. Think it will save lots of space. Love the clip storage....so pretty. Awesome idea about keeping 2 of the stencils and using one for ink and one for embossing paste! Now I know what to do with some of the duplicates I have! Thank you for the idea. Great ideas that you are sharing, after reading most of the blogs, I do believe I will be going to the 6 X 6 sleeves, the only thing is I wish I could 2 of each one. lol Thanks for sharing. 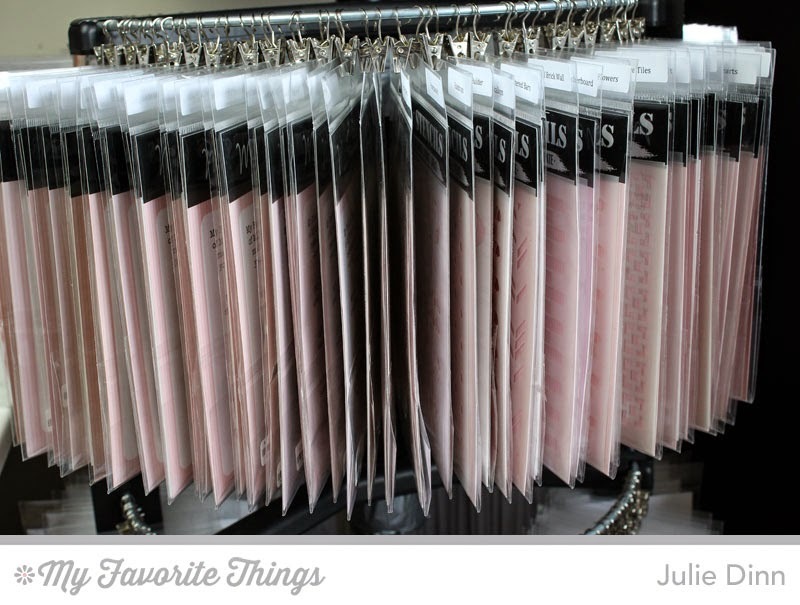 Good storage ideas, Julie. I sure hope that I can master the technique of dry embossing using the stencils. Thanks for sharing. Awesome storage ideas!! I hope that your storage pockets arrive soon! I'm glad you've found a better storage system for you stencils. I like how you put two of the same stencils together....each doing a different job. I have that tower and can't find tier 2 for the life of me. And since we have moved and unpacked everything, I am guessing it is 'lost'! But great idea GF!